The Sport Squad Ring Toss Game brings fun to every family event! It’s great for teaching kids team-bonding skills, improving their hand-eye coordination and teaching them valuable motor skills. But hey, adults will love to join in on the fun too! The Sport Squad Ring Toss Game is small enough to transport but big enough to draw in a huge crowd! This lightweight game system fits in the included drawstring carrying bag and can be used at the beach, the park, tailgates, your backyard, family get-togethers or every day in your living room. Enjoy a classic game of ring toss with family and friends anywhere you go. This game is great for all ages and is as simple as throwing the included four rings to see who can get the highest score out of the clearly labeled, different-valued poles. 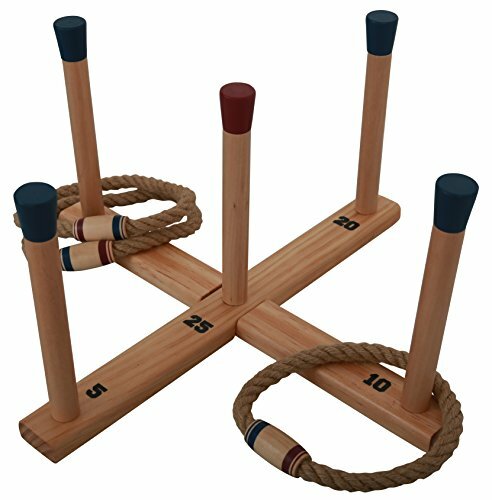 The ring toss game is made of high quality wood and durable rope to withstand everyday play! Sport Squad games are made to bring family and friends together. It’s time to put down the screens and enjoy some interactive fun! UNIQUE SCORING DESIGN: Each of the 5-poles represents a different value, teaching kids to add their own score! Ring toss is a great classic game for bringing family and friends together! CHILD DEVELOPMENT BENEFITS: The perfect game to improve children's hand-eye coordination, motor skills and socializing skills! COMPACT AND PORTABLE: The game is lightweight and comes in a drawstring bag so you can bring the fun with you everywhere you go! Perfect for the backyard, indoors, tailgates, the park, camping and anywhere else you can think of! QUALITY AND CLASSIC MATERIALS: Made out of real wood!